Wave Action builds on the wide-ranging professional experiences of Colin Speedie and Louise Johnson. Background: Lou has spent her professional career aiming for improved management of development-related environmental impacts in relation to biodiversity and ecosystem services. Since departing her role as group-wide Biodiversity Advisor for a major oil & gas company in 2004, her consultancy work has focused on both marine and terrestrial conservation challenges. 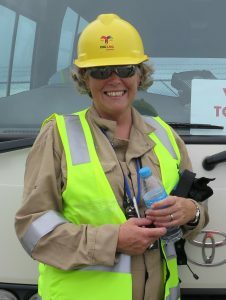 Her 25+ years working within the Extractives sector allows a unique perspective on how companies can best apply the mitigation hierarchy, and the importance of good governance. Lou’s work is primarily with Lenders, conservation NGOs and responsible extractive companies, seeking to ensure energy and mining related biodiversity impacts are managed responsibly, civil society is effectively included, and Governments and companies make informed decisions. Lou’s work has a global remit, with projects in Papua New Guinea, Mozambique, Guinea, Ghana, Myanmar, Rep. of Congo, Tanzania, Uganda, Madagascar and Scotland. Currently her primary focus is as Independent Biodiversity Expert, performing due diligence and compliance reviews on behalf of international Lending Institutions where development projects need to comply with Lender Standards (such as the IFC’s Performance Standards). Lou’s LinkedIn profile here. Background: Colin has owned boats since childhood, and has spent over twenty years working as a professional yacht skipper and team leader on yacht based research projects, including projects on whales and dolphins, basking sharks and turtles. Colin’s practical expertise from decades of boat construction, modification and maintenance has long been sought by people eager to get out on the water. Colin now provides a specialist consultancy service to cater for clients individual requirements, advising prospective yacht owners on both new-build construction specifications and suitability for their needs, along with advice on used-boat options where this is required. Colin founded and is Director of the WiSe Scheme, the UK’s national marine eco-tourism training and accreditation scheme. He has undertaken effort-corrected boat-based surveys for basking sharks around the Hebrides and western UK waters for many years, in later years made possible by the support of the Swiss Shark Foundation. From 1999-2007, he was director of the Wildlife Trusts Basking Shark Project, and from 2002-2007 was Principal Investigator on the Earthwatch Institute (Europe) project “Britain’s Basking Sharks”. Together, he and the team covered nearly 25,000 km of effort based surveys between the English Channel and the Outer Hebrides aboard the 11.7m cutter Forever Changes. In 2017, Colin published his book entitled ‘A Sea Monster’s Tale – In Search Of The Basking Shark’, available from publishers Wild Nature Press. 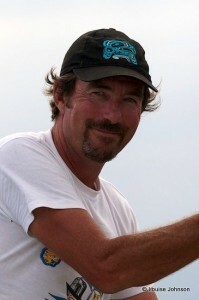 He has also worked for many years as a photo-journalist, covering a wide range of subject matters – you might like to visit the Attainable Adventure website, which hosts a large collection of Colin’s articles in relation to yachts and yachting, ranging from technical guidance to travelogue pieces.